Rudy Cheeks: You went to RISD in the early 1970s. Did you like Providence or were you anxious to leave? Bobby Grossman: Providence had its charm and appeal, but I was eager and anxious to return home. It was time to move on. I paid my Benefit Street parking tickets, back rent to Ben Weiss and my delinquent RISD library fines. I never looked back. I had already networked using some of my resources of friends who had already relocated to New York City. Throughout my junior year, while on breaks and vacations, I visited Madison Ave ad agencies with my portfolio. I also connected with a few record companies and magazine publishers. And I actually met up with a few artists I admired, too. In the fall of ’75, my friend Andre Talley, a Brown University graduate, introduced me to Warhol. I visited The Factory and met Andy and showed him my work. He advised me to work large. While I was there, Andy phoned Lou Reed and I taxied over to the Gramercy Park Hotel and I spent a few hours with Lou. Lou seemed to like my work also. My portfolio included a few drawings and collages of him, so why wouldn’t he? That afternoon Lou treated me to a premixed Coney Island Baby on his black boom box. It sat beside a TV on his dresser alongside a stack of Richard Pryor cassettes and a line-up of prescribed medication. I was awestruck. Over the years I would see Lou around town, but I never knew him very well and it was never as special as this first meeting. RC: After moving to NYC, you were got interested in photography (you studied illustration). You were hanging out with the bands at CBGB and other venues. Any stories about those days? BG: My downtown introduction to the CBGB music scene began with Talking Heads. Chris invited me down for their first and early shows. A few years later, with assistance from Tina and the band, I helped create the Psycho Killer 45 and EP. I think I was the only who photographed them in the recording studio for “Talking Heads ’77.” After a few early achievements I abandoned the illustration. I didn’t really know what was to come of it but I had more ambition documenting the downtown art and music scene than my career of choice. CBGB was the best, it was like home, our neighborhood bar. I think I was there every night for two years. It was quite a run. But one night in 1979, Glenn O’ Brien’s TV Party was on location at Hurrah on 66th – Broadway. Jim Fouratt phoned to inform me that David Bowie would be at the club that evening but I already knew since Glenn told me. Later that night everyone was hanging out and talking with David, but I stood on the sidelines like a wallflower since I didn’t want to be amongst the cluster socializing with him. A few moments later David approached me but I was looking away. In a playful manner he shoved me. And with this introduction, to break the ice he said, “You’re a snob.” We talked briefly and I gave him my card. David Bowie called ME, “a snob!” How cool is that? RC: Your Kellogg’s Corn Flakes series got a lot of praise and attention. Did you just sort of stumble into this or were you thinking that maybe you could make a living doing photography? Later on I would visit friends with a shopping bag filled with fruit, milk cereal bowl and spoon and over time I had a series of friends eating Corn Flakes with their favorite fruit. Tina Weymouth used guitar picks and Tomata du Plenty, cherry tomatoes. During my 8 years documenting the scene I never had a steady job. Just work, here and there. During this time I did random illustration work for the Village Voice, High Times and other local publications, but it didn’t really pay the bills so I worked for my dad at the Empire State Building answering phones and stuff like that. RC: Did you meet Shepard Fairey at RISD or did you meet him later? BG: Back in 2010 Shepard Fairey was collecting images for his May Day exhibition at Jeffrey Deitch Projects. This was to be Jeffrey’s last show before he relocated to LA to curate and oversee the LA Museum of Modern Art. And now he’s back in New York but that’s another story. I didn’t know Shepard from RISD or Providence. Shepard always loved my Debbie Pepsi image, but didn’t know Debbie. So after a few phone calls, I introduced Shepard to Chris and Debbie and they really hit it off. Two years ago Shepard designed Chris Stein’s Blondie photo book commemorating Blondie’s 40th Anniversary. Next year this image will appear on a t-shirt. Debbie and her merch people are producing a high-end line of tees so I am looking forward to a Shepard Fairey Debbie Harry t-shirt for myself. And the silkscreen poster will be in my LOW FIDELITY show too. RC: I find it interesting that you were at RISD at the same time I was hanging out there and then, in New York, you met a lot of the artists and musicians that I have also met. We were like ships passing in the night. How come we never met? BG: Over the years I have visited Providence quite a few times and it’s nice to see the changes. I’ve been to a couple of reunions and its fun meeting up with old friends. 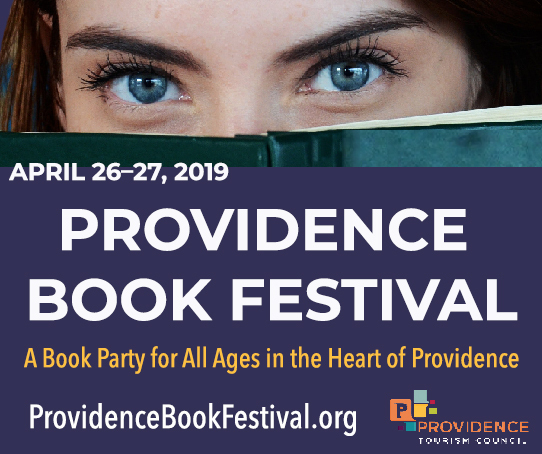 I’m not into the organized events, but I enjoy walking around the Brown and RISD campuses, up to Thayer Street and dining at my fave restaurants. Last year I had asked a few friends to look into local galleries, but nothing really came of it. Googling galleries and looking online wasn’t the best approach either. So, as a last resort I contacted my old friend painter Marc Kehoe and everything fell into place. Marika Van Veesem of the Van Veesem Gallery in Tiverton is curating LOW FIDELITY along with Darren Hill of POP. RC: Is there anything else you want us to know about the show at POP? BG: LOW FIDELITY found its perfect venue. 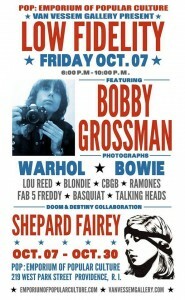 The installation will include 40+ of my photos and Shepard Fairey’s fine art. My friend Dave will provide the evening’s entertainment. David Johansen LIVE! How cool is that? And we are going to have a party!